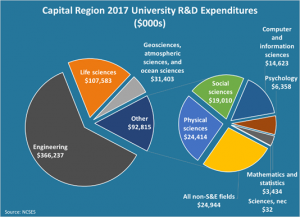 Capital Region colleges and universities saw a 5.9 percent annual increase in R&D expenditures in fiscal 2017, according to a Center for Economic Growth (CEG) study of new data from the National Center for Science and Engineering Statistics (NCSES). Federal funds supported $192.6 million in Capital Region university R&D expenditures in fiscal 2017, up 16.2 percent from the previous year. Contributing to that gain was SUNY Polytechnic Institute’s 2015 designation as the lead institution for the public-private partnership known as the American Institute for Manufacturing Integrated Photonics (AIM Photonics). 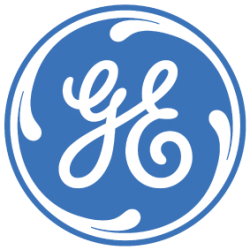 This program is being funded with a $110 million federal grant, $250 million from New York State and $250 million in private support to buy equipment and to support operations over five years. Nonprofit organizations drove $72.6 million in university R&D expenditures, up 183.2 percent from the previous year. The lion’s share of that increased nonprofit funding was at SUNY Poly. Institutions, namely UAlbany and RPI, also spent more of their own funds on R&D, totaling $135.7 million, up 25.3 percent from fiscal 2016. Life sciences R&D expenditures totaled $107.6 million in fiscal 2017, up 2.4 percent from the previous year. This growth came amid the state’s new $650 million Life Sciences Initiative, which aims to spur the growth of a new, world-class research cluster in this field. The fastest-growing R&D fields with sizeable expenditures (>$10 million) were social sciences (up 81.8 percent to $19 million); physical sciences (up 53.2 percent to $24.4 million); geosciences, atmospheric sciences, and ocean sciences (up 51.5 percent to $31.4 million); computer and information science (up 29.1 percent to $14.6 million); and all non-science and engineering fields (up 12.2 percent to $24.9 million). For examples of life sciences-related R&D being conducted by researchers at Capital Region colleges and universities and others throughout the SUNY system, see CEG’s The Research Connection, a new quarterly feature in the organization’s e-newsletter, The CEG Indicator. 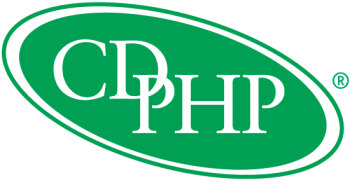 The Research Connection highlights R&D being conducted by researchers at Capital Region colleges and universities and others throughout the SUNY system. The Research Connection spotlights academic R&D in CEG’s focus technology sectors: Nanotechnology and Semiconductors, Cleantech/Energy, Biotechnology, Advanced Materials, Population Health Technology and Information Technology. Each edition of The Research Connection will highlight several research projects in a specific technology sector. The Research Connection will keep CEG investors and CEG Indicator subscribers informed on the cutting-edge R&D that is being conducted by SUNY and other academic researchers that could potentially transform their industries. It will also encourage collaboration, patent, licensing and other opportunities.